I started raining about 10:00 am and has turned into a daylong drencher here in Togo. There is GREEN at the bottom of Togo. The green on this map is where there is rain forest. I would say, the prediction is rain. It is cooler now. A rain forest is in fun in way, too wet sometimes; however, when there is an extremely good rain forest the overabundance of green is amazing. Water plus Soil equals green. Of all the places on the planet to complain about lack of food, the one place I am not too excited to hear, is in a rain forest. The green explodes in a true rainforest, I am not going to say that Togo is a true rainforest, for one thing, most of the forest is missing, long ago logged for the Mahogany and other woods, and now used as the fuel to cook. There has been an environmental shock given to this area by my guess the loggers, and continues for firewood. I believe the food grows so easily in Togo; they do not even weed the gardens or care to clear the land properly. They in a way just turn the soil over; plant the seeds in big mounds and hope. 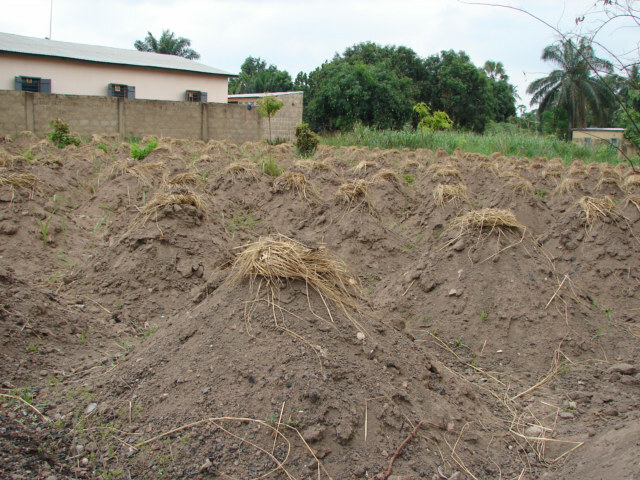 This is a photo of a large mound of dirt, as I understand in each mound they planted a Yam. The mounds are made in this teepee fashion so the heavy and persistent rain has a trough for the water to flow around the mounds, however allowing the yam to remain. This is not as easy to learn about as you think. I have been talking with a friend in the USA about Africa farmland. There is something missing in this puzzle, or there is some confusion here. The land is flat, too much water, plenty of cheap labor, and the land under tilled or cultivated. As best I can farm is less than 25 percent of the land that could be farmed, and I am being nice. I do not see this country and having any cash crops, they have garden crops they sell in the local markets. However, the actual, we grow this for cash, and sell to the world is hard to see. Ivory Coast or the areas closer to Ivory Coast are better, while in the Ivory Coast I could see cash crops grown easily. Togo eats rice as one of their staple diets, and I do not remember ever seeing rice grown here. Now, it does require more work to grow rice and working hard is not culturally normal, or I do not see it. I see most of the rice imported from Thailand or from a bag, that says the USA, but I think from India or Thailand and sold an Uncle Sam Rice, they also have Uncle Bob. I am not sure, seems like a great place in Togo, Ghana and Benin to start a large farm business. I think the Ivory Coast is already doing well. I have never seen a typical rain forest in Togo; however, they are doing an exceptionally good job of burning West Africa to cook. In addition, the loggers did and exceptionally good job of cutting down all the trees for lumber. This place is flat, easy to do all this.